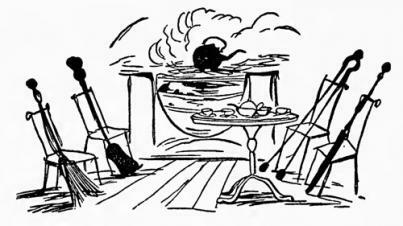 The Broom, the Shovel, the Poker and Tongs | Edward Lear: Two Hundred Years of Nonsense! And they each sang a song, ding-a-dong, ding-a-dong! Before they went back in the dark. Mrs. Broom was in blue (with a sash). And they all sang a song. "You have perfectly conquered my heart. I will feed you with cold apple-tart. And your shape is so slender and bright! Ain't you pleased with my song?" That you don't care about me a pin? Ah! why don't you heed my complaint? Because you are covered with paint? "What nonsense you're singing to-day!" Said the Shovel, "I'll certainly hit you a bang!" Said the Broom, "And I'll sweep you away!" They all became happy again. There's an end of my song.